Engine manufacturers are challenged to deliver emissions-compliant, quieter and more fuel-efficient powertrains without sacrificing performance and reliability. The use of sophisticated turbochargers, high pressure fuel injection and elevated mean effective pressure sets up an even greater torsional vibration force on the crankshaft. 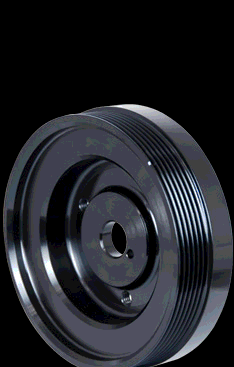 A quality viscous style crankshaft damper is an essential component to maintain durability standards. For over 70 years, Vibratech TVD (formerly Houdaille) has delivered the broadest industry leading experience in viscous damper design and development. ISO 9001:2015 Design & Development certified. Protects across wide frequency range and multiple orders. Longer product life compared to elastomer damper designs. Maintains operating tolerance in harsh environments. Race engine developer and manufacturer associated with major OEM racing division solicited Vibratech TVD to optimize a small diameter viscous damper at 10,000rpm for a naturally aspirated in-line four application. Viscous damper to replace current elastomeric design for improved durability and performance. New Vibratech TVD developed under the Fluidampr brand exceeded validation testing and was approved SFI 18.1 for use in professional motorsports. Crankshaft Damper Development Case Study. Part 1 – Introduction. Crankshaft Damper Development Case Study. Part 5 – Rapid Prototyping. Crankshaft Damper Development Case Study. Part 7 – Test Results.